When the AC unit fails, most people immediately panic. The reason for this is that your units never break at comfortable times. For example, we see very few malfunctions on nice, cool mornings or comfortable afternoons. Most of the AC problems happen when the unit is overworked – like blazing summer days or muggy nights. 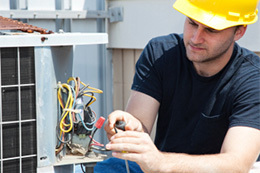 Air units are likely to break when they’re being overworked, and when you need it most, which is why Charlotte AC repair companies are always here to help. However, calling someone at 2 in the morning or on a hot afternoon can be stressful if you don’t know which company to hire. The only way to really feel confident that you’re hiring a reputable Charlotte AC repair company is to prepare beforehand and call a few in for some regular maintenance. An ounce of prevention is worth a pound of cure in more ways than one. Asking a Charlotte AC repair company to come out and maintain your unit could be a way of inspecting their worth ethic, communication, and postponing any future emergency repairs at the same time. But when you call these companies out, what exactly do you look for? Well for starters, look for a valid license and insurance. Getting a company that has met the certifications for their license and is backed up by current insurance is a good way to know that they will be able to cover any losses that occur on accident. You should also test their reliability – do they show up on time? Do they follow up to make sure the unit is running well? « When Should You Call The Pros?